When I illustrated the story of Peter Pan a few years ago, I spent the best part of 10 months working solidly on Peter’s world: Neverland. Day after day I’d get out of bed and face hours of intensive work at the drawing board bringing J M Barrie’s famous story alive. When it came to drawing Hook falling into the crocodile’s waiting mouth I felt the story had lost its most intriguing character, and to some extent its heart. If my nemesis had been a selfish and arrogant little boy who infuriatingly always got the better of me, I’d have become a twisted villain like Hook too. And so – Captain James Hook, scourge of the cocky everywhere – I salute you! 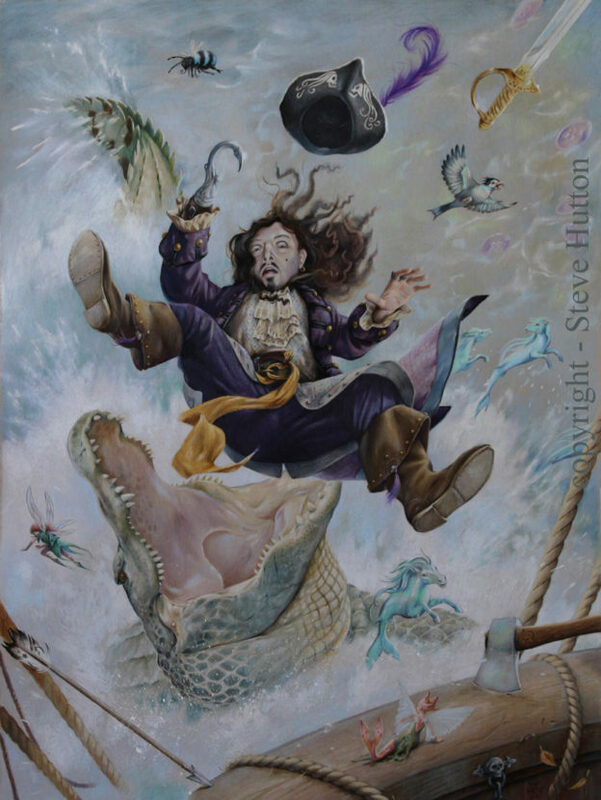 This entry was posted in Other writing, Uncategorized and tagged Captain Hook, crocodile, Peter Pan on October 21, 2017 by Steve Hutton.